Companies extend the life of equipment to save money and stay under budget. What isn’t obvious, however, is that the cost to own older forklifts actually starts going up each year after a certain age. The Evergreen Lease is designed to keep costs low, while also allowing an upgrade on your equipment. Get rid of the equipment that is driving up costs. Your operators will thank you for a nicer ride. Service and maintenance are included in the lease, so you know your costs will stay low. For the first time, know exactly how each truck is running and spot problems before they get big. Old forklifts break down more often. When they do, replacement parts are expensive and hard to find. Similarly, old batteries actually create real costs for a company. Operators can’t get through a shift and weak batteries cause forklifts components to overheat and fail. We provide detailed analysis of how much your fleet is costing, where money can be saved, and how certain practices in your specific operation are affecting equipment life. You get concrete information about your actual fleet – no hypotheticals, no guesswork. We have access to thousands of low-hour, off-lease forklifts in addition to new equipment from any manufacturer of your choosing. 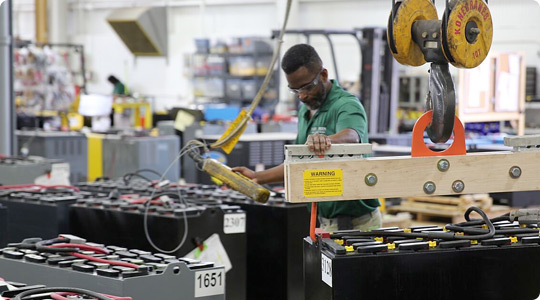 Additionally, we guarantee our batteries in our leases, so there are no questions about the quality of the battery. We leverage these resources to provide full service leases that reduce your costs and improve your equipment. We continue to provide reporting about how to extend the life of your equipment. Login online and see how your batteries are being used, charged, and watered in real time. For the first time, you can get complete clarity of your operation delivered through battery tracking devices. You can use this as a starting point to plan for replacement. You don’t even have to call us again (but we hope you will)! Get started with our free site survey today! © 2016 Evergreen Resources, LLC. All Rights Reserved.